Experience Asheville’s BRIGHTEST holiday tradition at Winter Lights at The North Carolina Arboretum. 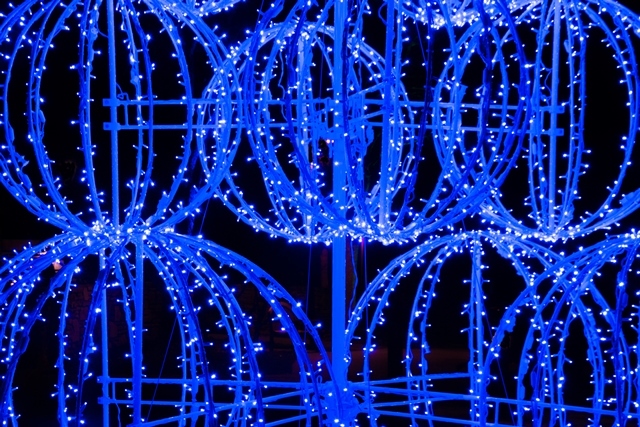 Open nightly November 18, 2016 – January 1, 2017, from 6 to 10 p.m., Winter Lights is an outdoor holiday light exhibit placed throughout the Arboretum’s nationally-known gardens. Walk through a winter wonderland and enjoy uniquely-lit displays and landscapes composed of nearly 500,000 energy-efficient LED lights. Listen to the sounds of your favorite holiday tunes or enjoy a cup of holiday-inspired cocoa, cider or beer. Additional food and beverage items are available for purchase and the Arboretum’s Savory Thyme Café will also offer a special holiday buffet every weekend (reservations are recommended). All Winter Lights tickets are date-specific and must be purchased in advance; tickets will not be sold at the gate. All tickets are $15 each. Ticket holders on Thursday nights will receive one (1) FREE cup of hot chocolate. Available on Fridays and Saturdays only, this special ticketed event offers visitors the chance to enjoy a holly, jolly ride from downtown Asheville or Hendersonville to Winter Lights courtesy of The Trolley Company. Upon arrival, tour guests will receive a complimentary cup of hot chocolate and access to the Winter Lightsexhibit. Pick-up is at 6:00 p.m. from downtown Hendersonville’s Visitor Center or downtown Asheville’s Renaissance Hotel, and guests will be dropped back off at 8:30 p.m. Tickets are $27 per person (children 4 & under are free) and can be purchased through The Trolley Company’s website here. (Note: Arboretum member discounts do not apply for this tour). For additional questions, please call Eva Ritchey at The Trolley Company at 828.606.8606.